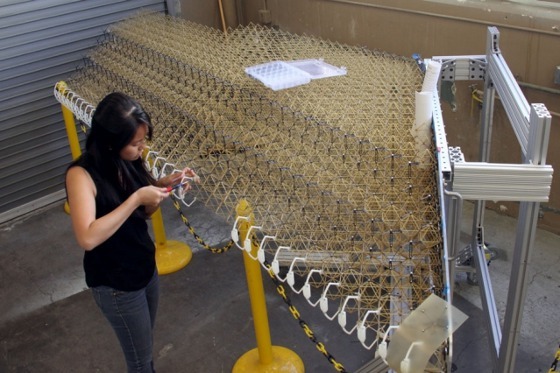 The new approach to wing construction could afford greater flexibility in the design and manufacturing of future aircraft. 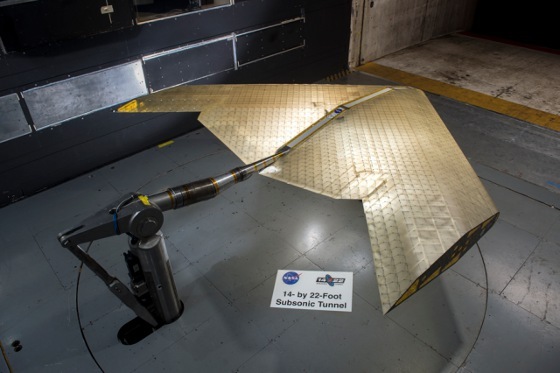 The new wing design was tested in a NASA wind tunnel and was described April 1 in a paper in the journal Smart Materials and Structures, co-authored by research engineer Nicholas Cramer at NASA Ames in California; MIT alumnus Kenneth Cheung SM '07 PhD '12, now at NASA Ames; Benjamin Jenett, a graduate student in MIT's Center for Bits and Atoms; and eight others. Jenett explains that for each of the phases of a flight -- takeoff and landing, cruising, maneuvering, and so on -- each has its own, different set of optimal wing parameters, so a conventional wing is necessarily a compromise that is not optimized for any of these, and therefore sacrifices efficiency. A wing that is constantly deformable could provide a much better approximation of the best configuration for each stage. While it would be possible to include motors and cables to produce the forces needed to deform the wings, the team has taken this a step further and designed a system that automatically responds to changes in its aerodynamic loading conditions by shifting its shape -- a sort of self-adjusting, passive wing-reconfiguration process. While this version was hand assembled by a team of graduate students, the repetitive process is designed to be easily accomplished by a swarm of small, simple autonomous assembly robots. The design and testing of the robotic assembly system is the subject of an upcoming paper, Jenett says. The individual parts for the previous wing were cut using a waterjet system, and it took several minutes to make each part, Jenett says. The new system uses injection molding with polyethylene resin in a complex 3D mold, and produces each part -- essentially a hollow cube made up of matchstick-size struts along each edge -- in just 17 seconds, he says, which brings it a long way closer to scalable production levels. Because the overall configuration of the wing or other structure is built up from tiny subunits, it really doesn't matter what the shape is. "You can make any geometry you want," he says. "The fact that most aircraft are the same shape" -- essentially a tube with wings -- "is because of expense. It's not always the most efficient shape." But massive investments in design, tooling, and production processes make it easier to stay with long-established configurations. 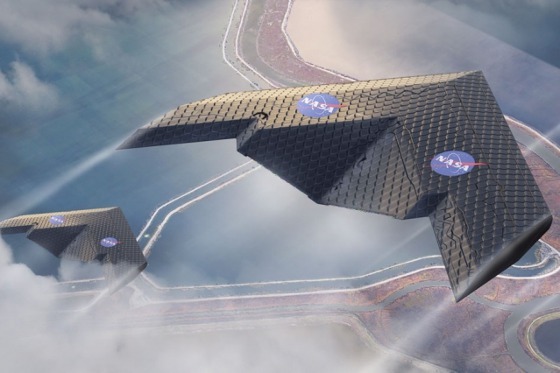 "The research shows promise for reducing cost and increasing the performance for large, lightweight, stiff structures," says Daniel Campbell, a structures researcher at Aurora Flight Sciences, a Boeing company, who was not involved in this research. "Most promising near-term applications are structural applications for airships and space-based structures, such as antennas." The team included researchers at Cornell University, the University of California at Berkeley, the University of California at Santa Cruz, NASA Langley Research Center, Kaunas University of Technology in Lithuania, and Qualified Technical Services, Inc., in Moffett Field, CA. The work was supported by NASA ARMD Convergent Aeronautics Solutions Program (MADCAT Project) and the MIT Center for Bits and Atoms.